AAC of Andalusia is located in the New Business Incubator Building situated at the Andalusia-Opp Airport, Andalusia, Alabama. The facility consist of approximately 6,000 square feet of instructional and administrative space including a faculty administrative office, secure records storage space, two large classrooms, a welding lab, a composites lab, a large sheetmetal /woodworking lab and suitable bathroom facilities. The sheetmetal/woodworking lab has a space for housing an aircraft suitable for instruction. Program length is six (6) semesters, which usually takes two years to complete. Classes are offered on the Aviation Campus at Ozark and Andalusia. 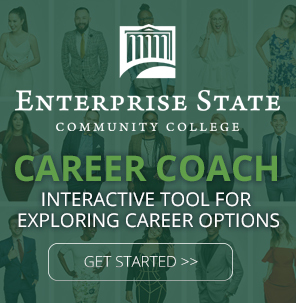 At Enterprise State Community College, we’re focused on a creating a total collegiate experience. Our main campus offers students the opportunity to get involved with a variety of student organizations, play on one of our athletics teams, or strut their stuff in our outstanding fine arts department. Our Student Center houses all amenities under one roof including the Financial Aid office, Admissions office, as well as our book store filled with text books and ESCC merchandise. Students love to meet in the Weevil Center to study or relax between classes and our mascot, ‘Bo’ Weevil, likes to make frequent appearances at Homecoming, Baseball games, and other community events. ESCC students that transfer to a University get 89% better grades than those that skip a two year college. ESCC was also named as a Top 120 Community College in the Nation twice by the ASPEN Institute. Our experienced instructors, opportunities for student involvement, and convenient classes make us a top choice when picking to further your education. A career in the aviation industry offers numerous benefits including a good salary, high job satisfaction, solid career potential, and mobility. Many jobs are available in the Wiregrass Area, in the Southeast U.S., and all over the world. Entry level job opportunities are available with aerospace manufacturing companies, commercial airlines, repair stations, and general aviation. Graduates can expect local starting salaries of $23+/hour and more, although pay varies among companies and locations. Program graduates receive an Associate Degree or Certificate and may enter employment, continue their education, or both. Visitors from neighboring states have easy access to AAC’s Ozark Campus via major highways throughout Alabama! Located on US Highway 231, the Ozark Aviation Campus is a local landmark and easily found. With various restaurants and motels providing excellent accommodations nearby, visitors touring the campus are assured of a pleasant stay in Ozark. Our e-learning campus allows Web-based learning without feeling isolated. Our ESCC professors are reachable and available to help students through their college experience. These classes are available for traditional classes including, but not limited to, English, Math, History, Art/Music Appreciation, Speech, Science and other courses necessary to complete your educational goals. Class offerings may vary per semester. Check availability in the current schedule of courses.